Appreciate for ordering from Friendship Force of Tokyo. The shape of Mt. Fuji with cherry blossoms s the symbolic motif of Japanese culture that was selected to this pin's design. 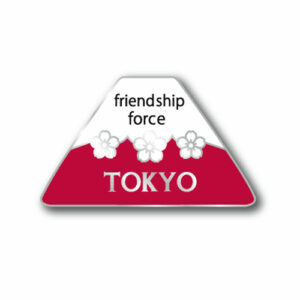 Friend Ship of Tokyo is the regional office of Asia area and following the spirits of Friendship Force International. They provide opportunities to explore new countries and culture from the inside by bringing people together at personal level. Through the signature program of home hospitality, local hosts welcome international visitors into their culture, sharing with them meals, conversation, and the best sights and experience of their region by volunteer act.